Tim Dorsey to be honored at this year’s Indiana State Fair. Tim Dorsey, Manager of the CUE Farm at Butler, has won the 2017 River Friendly Farmer Award, a statewide initiative that recognizes farmers who do an outstanding job of protecting rivers, lakes, and streams through their everyday conservation management practices. The award is given by the Marion County Soil & Water Conservation District. Dorsey will be recognized by Lieutenant Governor Suzanne Crouch and leaders of the Indiana Conservation Partnership at this year’s Indiana State Fair. 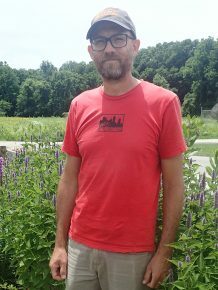 Nestled between the White River and the Central Canal, the Butler Center for Urban Ecology Farm produces mixed vegetables, fruits, nuts, herbs, flowers, and mushrooms. In recognizing Dorsey, the Soil & Water Conservation District noted that his goals are soil regeneration and holistic farm management, and that he uses a variety of techniques for conserve water and improve soil. Under his watch, water infiltration has improved visibly, which has made denser plantings possible. That not only improves revenue opportunities but combats weeds. The CUE Farm has also recently begun to see the presence of reptile life on the farm, which could be attributed to the layered perennial cover available as habitat. Butler University also maintains a managed prairie and riparian buffer adjacent to the farm.